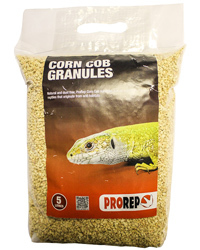 It is made from the centre of corn on the cob ground into a free-flowing granular substrate, which should not be used wet. Care should be taken to avoid significant ingestion of this product. Spread the substrate evenly over the bottom of the enclosure to a depth of at least 1-2" (2.5-5cm). Spot-clean daily and completely replace every two or three weeks, or more frequently if it becomes heavily soiled or wet.